An aortic aneurysm is a swelling of the aorta – the largest artery in the body that exits directly from the heart. Part of this blood vessel can become weakened which causes the vessel to enlarge like a ballon over time. If this condition is not detected, the aorta may continue to enlarge until it eventually ruptures or bursts. This is a dangerous and often fatal. Unfortunately, most of the time these people do not even make it to the hospital before they expire. Aortic aneurysms most often occur in the portion of the aorta within the abdomen. These are called abdominal aortic aneurysms. About 25% of the time they also involve the portion of the aorta located within the chest or upper abdomen. These aneurysms may also require surgery for repair and are called thoracoabdominal aneurysms or thoracic aneurysms depending on their location. It is not entirely known why aneurysms occur. Certain people are at greater risk for this condition, including those with the following risk factors. Age: Abdominal aortic aneurysms are more likely to occur the older you get. People who get aortic aneurysms are typically older than 60. Tobacco use: Tobacco is a big risk factor for aortic aneurysms. The longer the use, the greater the risk. This includes smoking tobacco as well as chewing. High blood pressure: High blood pressure increases the chances for developing an aneurysm. The pressure can contribute towards damage blood vessels. Atherosclerosis: Another factor that can contribute towards damage of the blood vessel is atherosclerosis. This buildup of fat and other substances can damage the lining of a blood vessel. Being male: Men are five to ten times more likely to develop an aortic aneurysm. On the other hand, women have a higher risk of the aneurysms rupturing. Race: Aortic aneurysms are more common in Caucasians than other races. Family history: People who have a family history of aortic aneurysm are at increased risk. This is especially true if someone in the immediate family had an aneurysm. People who have a family history of aneurysms tend to develop aneurysms at a younger age and are at higher risk of rupture. Unfortunately, aortic aneurysms are silent. They rarely cause symptoms like pain until they are about to rupture. If an aneurysm is about to rupture, it can cause a throbbing pain in the abdomen or in the back. Once they rupture, they often cause fainting and severe side or back pain. Fortunately, aortic aneurysms usually grow slowly at about half a centimeter per year. Once detected there is often time to repair the aneurysm before it bursts. Because aortic aneurysms do not usually produce symptoms, they are often diagnosed when doctors are looking for other problems. For example, a patient in a minor motor vehicle accident who gets an abdominal CT scan. Aortic aneurysms can also be diagnosed clinically when a doctor if performing an examination of the abdomen. However, since the aorta is located just in front of the spine, it is hard to feel. Aortic aneurysms can only be detected by physical exam about 50% of the time. The most common way aortic aneurysms are diagnosed is with an abdominal ultrasound. If more imaging is needed, a CT scan may be ordered. This shows the aorta in greater detail and gives exact measurements of the size of the aneurysm. This test also enables the physician to tell which surgical options are available. Since patients with atherosclerosis are at increased risk, most vascular surgery patients who have multiple risk factors (such as a history of smoking, advanced age, atherosclerosis, family history, etc) will receive an ultrasound to evaluate for an aneurysm. As part of the welcome to Medicare Program, male patients from the age of 65 to 75, who have ever smoked, are eligible for a one time ultrasound to screen for abdominal aneurysms. Those with a family history of aortic aneurysms or multiple risk factors should also consider obtaining an ultrasound to screen for this disease. In open surgery, an incision is made in the abdomen and the swollen part of the aorta is replaced by an artificial aorta. It is made of a durable woven material and is sewn into place. Open aortic surgery usually requires several days in the hospital and can require additional time for recovery. Some of the risks include heart and lung complications such as pneumonia and heart attacks, wound infections, urinary infections, and poor blood supply to the intestines which is called colonic ischemia. Regardless of the risks, in some patients this is the best option for repairing the blood vessel. 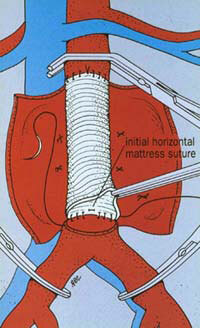 After this procedure is finished and recovery is complete few follow up tests are needed to look at the aorta. The second option to repair an aortic aneurysm is endovascular repair. This is a much less invasive surgery where two small incisions are made in the groin. A large stent is inserted into the aorta that covers the diseased portion of the vessel and eliminates the risk of rupture. The recovery is usually much quicker but there are still risks with every surgery. 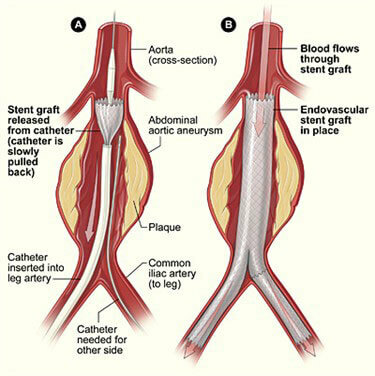 Once this procedure is finished, patients will need regular CT scans and/or ultrasounds to make sure the stent is still stable and there is no blood flow within the aortic aneurysm. ¿Afecta la obesidad y el peso a las varices?